A novel based on Charlotte Brontë’s notes. Many modern writers have tried their hands at writing books in the style of classic authors. Clare Boylan succeeds in making Charlotte Brontë come alive on the page again. When Charlotte Brontë, author of the classic novel “Jane Eyre”, died in 1855, she left behind 20 pages of a manuscript of a new novel, along with some other scraps of pieces she had been working on. 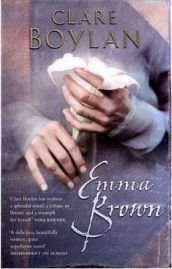 Almost 150 years later in 2003, Irish author Clare Boylan took it upon herself to complete what Charlotte had begun, and published Emma Brown. Despite being published in the 21st century, this is truly a classic novel, and a credit to the Charlotte Brontë name and legacy.